Neuroscientists are mystified about many things related to the study of consciousness, beginning with what the word means and the actual seat of the mind’s awareness: is it in the brain, a wider field of energy that surrounds and interpenetrates the body-mind, or does consciousness reside in both? A recent brainwave study conducted on Australia-based Reiki healer Frans Stiene and his American subject Susan Andrews answers these questions and confirms the viability of two brain dynamics that neuroscientists do widely agree on: neurogenesis and neuroplasticity. Neuroplasticity is the ability of the brain to rewire neural networks as people learn new skills or ways of being in the world. For example, if you decide to learn to play the piano, when you sit down to practice your brain borrows nerve cells, or neurons, from other regions, directs them to its musical centers, and then wires these activated neurons to your hands’ motor control centers to form a new neural network. The more you practice, the faster and better this neural network operates, until piano playing becomes second nature to you. The brain has proved to be quite the maestro. It can learn anything. And more importantly, its ability to expand beyond ordinary awareness seems to be unlimited. However, the brain is a conductor and not a composer. It cannot produce new scores—that is, new nerve cells—on its own. It forms new nerve cells, composes new music, only when you engage in activities that produce high-frequency gamma brain waves and lower frequency theta waves. When I first hooked up Frans Stiene to my unique electroencephalograph, the Mind Mirror EEG, on April 7, 2011, I was pleased to see high-powered gamma frequencies in his brain waves at 30-38 hertz. In the ensuing four years, I co-developed new Mind Mirror software on a state-of-the-art neurofeedback device that measures up to 64 hertz of gamma and provides advanced data analysis capabilities. 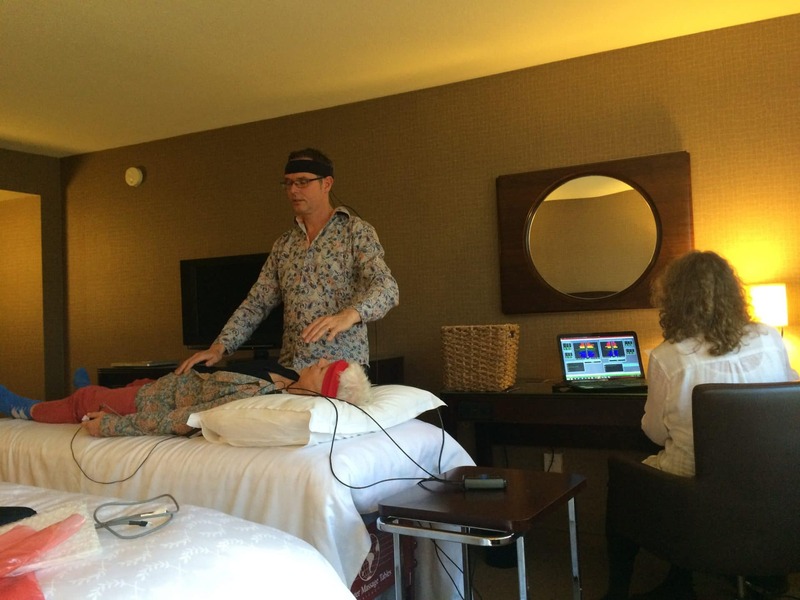 With this new technology, I began to study the brainwave patterns of other hands-on healers, intuitives and long-term meditators who were producing gamma waves. All of them reported the same subjective experiences as Frans did in our first study: a sense of vast, open spaciousness and non-dual union with a higher power. This higher power is typically understood to be a quantum field of cosmic light filled with creativity, wise personal and universal guidance, and love. What struck me about my second study on Frans with the new Mind Mirror on September 21, 2015 was his increased amplitudes of gamma at 30-38 hertz and newly visible gamma amplitudes appearing at up to 64 hertz. Data analysis showed that he was transferring his gamma waves to Susan, whose gamma waves were low to begin with and steadily increased during their 19-minute healing session. The transference of Frans’ Gamma Synchrony brainwave pattern to Susan was not surprising in and of itself. Healers, by the laws of physics known as magnetic and harmonic resonance, transfer energies as a matter of course; that is how healing occurs. What startled me—even though it was logically foreseeable—was clear proof that Frans’ gamma amplitudes had increased and stabilized since our first study. His daily meditations had amplified his theta waves, and his healing work had amplified his gamma frequencies in a clear case of neurogenesis and neuroplasticity. Immediately after Frans’ 2015 healing session on Susan Andrews, I asked her to describe her subjective experience. She reported the sensation of “vast spaciousness,” intuitive insights, and a deep sense of connectedness with Frans. Susan, a healer herself, was not aware of any changes in her body, so I asked Frans to do a ten-minute healing session on me. I had recently had surgery and was in significant pain at the time. Unfortunately, I was not hooked up to the Mind Mirror nor was Frans. But my subjective experience was identical to earlier experiences of gamma in meditation and while instructing Mind Mirror students known to be gamma producers. Waves of healing light flooded my body, and an orb of indigo light pulsed in the third eye area of my forehead. I felt as if I were lifting up out of my body into my spirit. After the session there was no pain in my body, and my mind was sharp, clear and flowing with higher awareness. I had been fatigued and in pain during Susan’s session and accordingly had struggled a bit to monitor and sketch her brain wave patterns while keeping a time record of Frans’ movements around her body. After Frans worked on me, my mind’s awareness was distinctly different; I was united, coherent and expanded. My vision was so much sharper and sensitive that I noticed decorative details in the hotel room which had escaped my notice earlier. These are the effects of gamma on the brain and body, whether produced by oneself or transmitted by someone else. The best thing about gamma is that once it is experienced for a sustained period of time, it can return. I left Washington that night and during the first few days of a personal meditation retreat experienced the same illumination twice more. This was all it took to increase and sustain my physical healing. All deep-state meditators produce high amplitudes of the subconscious mind’s theta waves and the unconscious mind’s delta waves which, through neuroplasticity, condition what Mind Mirror operators call the Awakened Mind of clarity, creativity, insight, spiritual connection and intuitive awareness. This Awakened Mind pattern, composed of 14 frequency bars displayed as the shape of a human being, is an orchestration of all four brainwave categories—the conscious mind’s intellectual beta combined with sensory, daydreaming alpha, subconscious theta, and unconscious delta. This ideal brainwave pattern unites all of the brain’s abilities with each other and evokes peak moments of illumination that evoke the Evolved Mind brain wave pattern: a circular shape experienced as ego-surrender, unity consciousness, bliss and spiritual illumination. Biophysicist and Mind Mirror inventor Max Cade wrote in his seminal book, “The Awakened Mind: Biofeedback and the Development of Higher States of Awareness,” that the appearance of a higher-state brainwave pattern such as the Evolved Mind stabilizes lower states such as the Awakened Mind. Over the past decade of monitoring highly developed and spiritually conscious meditators, I have concluded, like Cade, that this is how the brain self-evolves. Once this maestro orchestrates a higher state of consciousness, it knows the score and plays that music repeatedly in order to advance its awareness, abilities and enjoyment of its highest potential. Frans’ maestro, reportedly accustomed to working overtime, was solely responsible for the brain changes I saw in the second study. His gamma flares seen in the first study stabilized his Evolved Mind and Awakened Mind brain wave patterns. These higher states of consciousness opened to a profound experience of cosmic consciousness which conditioned the Gamma Synchrony pattern that appeared in the second Mind Mirror study. In November of 2011, seven months after my initial Mind Mirror study on Frans, he had an experience of spontaneous illumination, or cosmic consciousness, which changed his life and his work. He had been teaching and conducting healing sessions for three weeks in different cities, and afterward attended a four-day meditation retreat. He ripped off his shirt, buttons flying everywhere, as his felt that his clothing and even his skin were restricting his consciousness. “I didn’t seem to fit in this thing called Frans anymore; I was too big,” he explains. He crawled into the forest and poured gallons of water over his head and body, which now felt insignificant. His body was no longer who he was. It had become a jacket. Six months later, changes in Frans’ physical, emotional, mental, spiritual and energy bodies were still underway. His intuitive knowing had increased and he was more aware of his surroundings. “Before, I was walking through life like a horse with blinkers (blinders) on. I was not seeing clearly. After this experience, I knew when people felt sad or needed to cry or I knew their questions. I became more compassionate. “Physically, my body had become so light that sometimes I felt like I didn’t have a body.” He also became more flexible, despite doing nothing to foster that, and his breathing shifted to both nostrils and became very smooth and soft. Everyone typically breathes through one nostril at a time. Frans’ descriptions of his new mind correlate with gamma studies by many researchers, including this writer, radiologist Andrew Newberg and neuroscientists Richard Davidson and Wolf Singer. The attentional awareness of whole-brain gamma synchrony opens to compassion, love, and a sense of self in mystical union with the universe and quantum field of light that composes and evolves all things. High-amplitude gamma frequencies surge power into the electrical networks of the brain. This surge unites the brain across regions and frequencies and, at the same time, forms new brain cells in our intellectual and creative centers. How can you help your own brain self-evolve? First, learn to meditate in order to develop attentional awareness and clear negative thought patterns which obstruct your mind’s evolution. Then follow your bliss. What makes you feel happy, inspired and excited about life lights up your heart and advances your brain wave patterns. If you can remember a time in your life when you felt blissfully happy and creative ideas spontaneously flowed into your awareness, that is your Awakened or Evolved Mind Pattern. It will lead you to the spiritual intelligence of gamma and a quantum leap in your consciousness. It helps to see your brain wave patterns on the Mind Mirror, a unique, composite brainwave display that feeds back to you what notes you need to change in the musical score of your consciousness. But if you do not have access to a Mind Mirror practitioner, or you do you not wish to explore the wondrous world of brain wave biofeedback, simply sit in meditation and relive peak moments of happiness or illumination. Ask to know what would benefit you and then act on that to rewire neural pathways to happiness and prosperity. Your maestro-like brain is standing onstage with a conductor’s wand in hand. Give it the best score you can imagine. And then just let the music play. Your maestro will orchestrate the most beautiful music—the kind that makes your heart sing, your mind awaken, and your body heal. No one and nothing else can do this for you. You are the maestro, the conductor, and the orchestra. Everything you need is within you. There is a quantum field of light that continually plays a divine symphony through the electromagnetic wave spectrum. This light and its sound resonate your energy field and mirror in your brain. Listen and play the music that makes your heart, mind, body and soul sing. What you resonate will uplift other people and the quantum ocean of light which informs, heals and evolves us. Judith Pennington is an internationally published journalist, author, and founder of the Institute for the Awakened Mind, an international consortium of EEG awakened mind trainers. Visit InstitutefortheAwakenedMind.com, BrainwaveTraining.com and EagleLife.com to see live brain waves, meditate online, and explore her free online publications, The StillSmallVoice and OneWorldSpirit, both devoted to personal and planetary peace. Hey would like to get int ouch and discuss what device or technology you are using……for possibles modificaiton or use during SWS period sleep consolidation..